I surely have been baking a good bit lately!! I can't help myself, it's just so much fun!! This was another tasty recipe from Joy the Baker. Yum! Elizabeth LOVES apples so this cake really made her happy!!! Preheat the oven to 350 degrees F and place a rack in the center of the oven. Butter and flour an 8-inch spring form pan and set aside. To sautee the apples: peel, core and dice the apples into 1/4-inch cubes. Melt the butter in a saute pan over medium heat until butter beings to bubble. Add the diced apples and cook for one minute, stirring with a wooden spoon. Add the sugar and continue to cook for 2 minutes. Turn the heat to low and cook the apples, uncovered for 4-5 minutes until they are softened. Remove from heat and allow to cool. You'll only use the sauteed apples for the recipe so you can discard any liquids that may have accumulated. To make the cake: cream the butter, sugar and spices in a stand mixer fit with a paddle attachment until light in color and fluffy. This may take 6 to 8 minutes. Stop the mixer occasionally, to scrape down the sides of the bowl and continue beating until mixture is light and fluffy. Add the egg yolks one at a time and continue beating until fluffy and glossy. Measure out the flour, salt, baking powder and baking soda. With the mixer set on low speed, add half of the dry ingredients to the batter. Mix until no flour streaks remain. Add the sour cream all at once and incorporate. Add the rest of the dry ingredients and mix until no traces remain. Fold in the cooked apples with a rubber spatula. The cake batter will be thick. Spread the cake batter into the prepared pan and distribute evenly. Take a knife and run it in a singular circular motion through the batter 1-inch from the edge of the pan. This will help the cake to rise evenly. Sprinkle the cake with the raw or granulated sugar and bake for 60- 70 minutes or until a toothpick inserted in the center of the cake comes out clean. Allow to cool for 10 minutes before removing the sides of the spring form pan. My hubby loves spice cake. I am sure he would love this. Thanks for sharing! 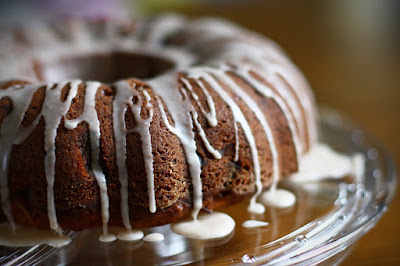 The Pioneer Woman has an awesome skillet apple spiced cake that you should check out! Hope you have a blessed day! I love apple cake - this one looks so delicious! All your recipes look wonderful, can't wait to try it. Have a great day! I just found your blog today from Beneath my Heart blog. Your blog is so cozy and yummy! You have some delicious looking recipes on here! Since Marcus is helping me bake a cake for the cakewalk I'll have to show him this recipe. Your Spiced Apple Cake looks delicious! Thanks so much for sharing with us at our Thanksgiving Edition of Full Plate Thursday! Hope you have a great week and come back soon!